Which graphite stocks have gained the most so far this year? These five companies on the TSX and TSXV are up the most year-to-date. As the electric vehicle (EV) revolution moves forward, uptake of these cars continues to drive demand for graphite, a key metal in lithium-ion batteries. Even though pricing for the metal has been disappointing for some investors in the past few years, a number of graphite-focused companies have still seen impressive share price gains. Below we run through 2019’s top graphite stocks year-to-date on the TSX and TSXV. All year-to-date and share price information was obtained on April 16, 2019, from TradingView’s stock screener. All companies listed had market caps above C$10 million at that time. Quebec-based SRG Graphite is focused on developing mineral deposits in the Republic of Guinea. The company owns the Lola graphite project, which, according to a 2018 preliminary economic assessment, is set to produce 50,200 tons of graphite concentrate per year over a 16 year mine life. In January, SRG announced that its on-site metallurgical laboratory had achieved its first 95 percent graphite samples. The company said commissioning was completed and production of graphite concentrate samples at various flake sizes and grade was ongoing. Before the first quarter of the year ended, SRG published the final drill results from its 2018 campaign. The company said they confirm its thesis of continued mineralization at depth and have further expanded the deposit’s potential. Advanced exploration and mining company Focus Graphite aims to produce graphite concentrate at its wholly owned Lac Knife flake graphite deposit in Quebec. Focus Graphite is also evaluating the feasibility of producing value-added graphite products, including battery-grade spherical graphite. During Q1, the company announced changes to its board of directors and the launch of oxidized graphene products by Grafoid, a graphene applications developer in which Focus Graphite holds a significant equity position. The company also closed a private placement for a total of C$1,275,000. A mine development company based in Toronto, NextSource Materials’ primary focus is its feasibility-stage Molo graphite project in Madagascar, which has a total combined graphite resource of 141.28 million tonnes at 6.13 percent total graphitic carbon. The company also holds the Green Giant vanadium project in the country. NextSource started the year by receiving conditional approval for its global environmental permit for the Molo project, which was given full approval on April 11. In February, the company was granted a 40 year mining permit. The mining license does not limit mining to any specific volume, allowing the company to produce graphite based on market demand. Canada Carbon is an exploration company with three Quebec-based graphite properties under its belt: Miller and Asbury, which are two past-producing graphite mines, along with the Dun Raven project. Last year, the Superior Court of Quebec ruled in favor of the company as part of a dispute about the Miller project with the town of Grenville-sur-la-Rouge. During Q1, Canada Carbon provided an update on the judicial review and appeal. Graphite One is focused on becoming an American producer of high-grade coated spherical graphite primarily for the lithium-ion EV battery market. The company plans to develop its Graphite Creek deposit, located in Alaska, into a vertically integrated operation. During the first three months of the year, the company announced a name change, share consolidation and loan repayment, as well as an updated mineral resource estimate. The most recent estimate increased the measured and indicated tonnage to 10.95 million tonnes grading 7.8 percent graphitic carbon, all using a 5 percent graphitic carbon cut-off grade. 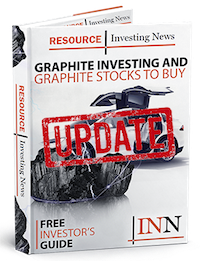 Editorial Disclosure: Canada Carbon, Focus Graphite, Graphite One and NextSource Materials are clients of the Investing News Network. This article is not paid-for content. The worlds best Graphite mine is Syrah SYR:ASX nothing will complete in quality and production cost.